I've played in many symphony concerts, I've attended them live, but I've never gone to see a symphony concert at a movie theatre. That is, until Sunday, when I went with one of my students and her mom to the local AMC movie theatre to watch Janine Jansen play the Mendelssohn Violin Concerto with the Los Angeles Philharmonic and Gustavo Dudamel. The all-Mendelssohn also included the Hebrides Overture and the Scottish Symphony. As you can see, the sight lines were excellent! (I took this picture with my cell phone) Though this experience is not the same as going in-person to a symphony concert, it is still an experience that is satisfying and worth the time and money. Speaking of which, tickets to the movie theatre version of the concert were $18 for children, $20 for seniors and $22 for adults. Tickets for the actual concert at Disney Hall ranged from $75 to $185 apiece (plus the $11 to park!). I love a live performance -- the feel of the sound waves coming straight from the instruments and bouncing around in a great acoustic hall, the presence of so many people, all dressed up and sitting quietly, occasionally holding their breath all in the same moment. An invisible current runs through everyone, in a live performance. In the movie theatre, the concert had the feeling of, well, a movie! The sound, while good, still felt a little canned. At the same time, this kind of experience has its merits. The seats were quite cosy, the darkness of the theatre helps one focus on the concert. Also one can munch on popcorn and candy -- though as I discovered, popcorn is a little crunchy and loud while listening to a symphony concert! Being accustomed to disappointing turnouts for classical music events, I fully expected to be the only little group in attendance. Not so! We arrived 15 minutes early, and the place was packed. There were about 125 people in the theatre, mostly senior citizens, but including a decent number of young and middle-aged adults (I counted two kids, both violin students!). The ability to introduce each piece with an in-depth video proved to be perhaps the greatest advantage of viewing the concert in this format. Before the Mendelssohn Concerto, for example, an introductory video blended excerpts from an interview with Janine Jansen, an interview with Gustavo Dudamel and clips from the rehearsals held before the concert. For example, both Dudamel and Jansen spoke about how, in the Mendelssohn concerto, the violin enters so quickly, after just a measure and a half. With that music playing in the background, the video panned to Jansen, saying, "It has to come from nothing, but make all the sense in the world." These well-edited, intelligently assembled previews gave added dimension and context to the performance. I especially enjoyed hearing Dudamel speak of the Scottish Symphony, while leafing through his score, the video panning back to rehearsals in which the orchestra was playing and rehearsing those passages he described. The live performance was shot with many cameras, which could point the viewer to things to hear. For example, a passage of bass pizzicato in the second movement of the concerto might go unnoticed, but visually focusing on the bass section brings forth that part of the music. On the whole, this visual element helped bring out the layers of the music, though once, during the entrance after the cadenza in the first movement of the Mendelssohn concerto, I really wanted to watch Jansen's fancy bow-work with the spiccato bariolage, not the orchestra, even though the relevant melody in the orchestra and not with her! My only major complaint: There was a slight sight-sound delay, so that the visuals were slightly ahead of the audio. The faster the music was (for example, the last movement of the Mendelssohn concerto), the more the delay distracted from the music, as the performer's fingers were flying out of sync with the music. Fixing this small detail would make a big difference in my perception of this "feeling" more live. Overall, I think this movie theatre set-up would work very well for young people who would benefit from the detailed introductions to each piece, for people who would have a hard time with the considerable logistics of going to a live concert, for those who simply can't afford the ticket price and for those who would like to make a little event of seeing high-quality concert that is taking place in another city. I think classes could take advantage of the educational nature of these concerts. I could see a continuing education music appreciation class doing this as a field trip. I hope that symphonies continue to explore these new ways of getting their performances to a wider public. For more information on these kinds of programs, you can go to Fathom Events. Here is where the The Met Opera is also doing a number of theatre broadcasts, the next being Anna Bolena, on Nov. 2. I also noticed they are showing Lang Lang with the Philadelphia Orchestra later this month, on Oct. 22 and 24. You just type in your zip code, and they point you to theaters in your area. If anyone knows of other such broadcasts, you are welcome to share the link below. I went to this performance at a theater here in Miami and found it underwhelming. The sound wasn't anything special in its quality, really no different than listening to such a performance on YouTube. If these performances should draw young folks, it will be great., but the audience where I went was small, and like me, pretty old. It was a nice concert, and the experience was worth trying once, but I don't think I'll be back. I find it interesting that most of the people in the audience were seniors. It's hard to hear good, live music, especially on a fixed, low income. A lot of changes in the current marketing of classical music are being made to attract younger audiences, but that did not happen in this performance. Personally, I'm thrilled at the prospect of hearing live Music from the Met in HD in a movie theatre. It's the only way I could hear these performances. I was lucky enough to be in the house (I sometimes work with LA Phil and scored some decent tickets) and it was pretty amazing. I'm glad to hear people turned out for the shows elsewhere! 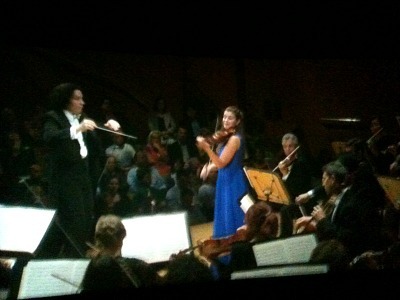 There's still some performances left - none with Janine, sadly - which you can find here http://www.laphil.com/dudamel. I suspect such recorded events would play better in a nice hometheater setup via the Blu-ray format nowadays (given all the recent advances in HT tech), and maybe that's really how/where they'd introduce and draw the younger (as well as middle-aged), tech-savvy crowd. In the past, I tried some operas/concerts on DVD, but that was never quite that satisfying to me -- I would rather just listen to a good CD of such instead. I should add though that I wasn't really all that impressed w/ the one live opera I attended at the Met in NYC (of Lucia Di Lammermoor) either. I had orchestra section seats about 2/3-3/4 back from the stage, so it's not like they were cheap seats, but it really just didn't have the electric immediacy and liveness that I would expect from a live performance nor was the set all that impressive from that distance either. Maybe I'm just too used to movies on a big screen (particularly those w/ high production values) to find opera sets impressive, particularly from typical distances. With the arrival of the Blu-ray format, I gave some (primarily) more recent operas/concerts another try, and they seem more satisfying to me on the whole than the old DVDs -- and also more so than the one live opera I attended. I should add though that I have a fairly big display (at 61" and typically viewed from only ~9ft distance) w/ some fairly high quality speakers and gear -- most theaters actually have lower quality audio setups even though they can pump up the volume much higher and have much larger screens (although perceived size is relative to viewing distance). Maybe my problem w/ live concerts have more to do w/ operas staged in such a large venue as the Met. For the most part, I haven't been let down by quality live performances in smaller venues. And although my violin skills are still only barely better than a beginner, I can definitely appreciate how different stringed instruments sound, especially closer up, and wouldn't confuse live music (from a reasonable distance) from a quality recording (played back on a quality setup).